Our current economy is a fossil-based economy. We are dependent upon oil and gas for our electricity, cooling and heating, fuels for transport, as well as for the production of materials and chemicals. A bio-based economy on the other hand, is not dependent upon fossil resources but is based on biomass. The bio-based economy can be seen as a part of a broader green economy. A green economy uses biomass, but also runs on wind and solar energy and encompasses resource efficient industries that fall outside the sphere of biomass production and usage. Strictly speaking fossil resources are also made up of biomass, but these came into being over millions of years, while biomass like plants and trees can be used immediately. 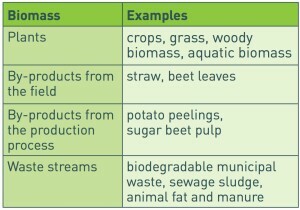 There are several types of biomass that can have valuable applications in the bio-based economy. At present, biomass is already used in quite a number of industries. Biomass is of course the basis for food and feed, but we also use biomass in industries such as the paper and construction sector. However, biomass could be used in more industries and for many more applications. Biomass could substitute oil in pharmaceutical applications, fine chemicals, chemical building blocks, plastics and it is already used for the production of fuels, heat and electricity. Unlike fossil resources, biomass is a renewable resource. Plants, trees and all other sorts of biomass will not be depleted, since they can grow over and over again. But although biomass is a renewable resource, it is not, at a given time, an unlimited re- source. Its production is dependent on resources such as land, nutrients and water, which are limited in nature. If we would rapidly increase our biomass consumption overnight, land previously used in other ways needs to be diverted to biomass production. This could come at the expense of food production (and hence cause rising food prices) or tropical rainforests (and hence cause biodiversity loss). Therefore, limits exist to the amount of biomass that can be produced sustainably. It is of utmost importance that we use the sustainably available biomass in the smartest way possible and that we increase the yield on the available land without compromising on sustainability. Poland wants to be a leader in the process of transition to the Circular Economy (GOZ). In parallel with the work on the road map to the GOZ in the Ministry of Development, Ministry of Environment is already preparing a pilot program GOZ, which will start in 5 rural and semi-urban areas – emphasizes Slawomir Mazurek, Deputy Minister of Environment. Deputy Minister Slawomir Mazurek presented the Polish priorities in the process of transformation of the circular economy (GOZ). In particular, he stressed the importance of developing a model GOZ for non-urbanized areas. – Poland wants to be a leader in this process and in parallel with the work on the road map to the GOZ in the Ministry of Development, Ministry of Environment is already preparing a pilot program GOZ, which will start on 5 rural and semi-urban areas – said Slawomir Mazurek. He explained that the aim of the pilot project, with financial support from the National Fund, is to work for the community good practices in the field of closed-circuit. Minister Mazurek, pointing to the Responsible Development Strategy and the National Waste Management Plan 2022 stressed that Poland has already adopted strategic documents taking into account the transition to an economic model with a closed circuit. – Refering to the on-going at the EU work on the package waste, seeing all of its environmental and economic advantages, one should strive to adopt realistic and feasible solutions. You must also have in mind the specificity of each Member State “- said Slawomir Mazurek. The Circular Economy Package consists of an EU Action Plan for the Circular Economy that establishes a concrete and ambitious programme of action, with measures covering the whole cycle: from production and consumption to waste management and the market for secondary raw materials. The annex to the action plan sets out the timeline when the actions will be completed. The proposed actions will contribute to “closing the loop” of product lifecycles through greater recycling and re-use, and bring benefits for both the environment and the economy. Economic incentives for producers to put greener products on the market and support recovery and recycling schemes (eg for packaging, batteries, electric and electronic equipments, vehicles).